Bob Marley and his songs put "reggae" into the musical mix of the world and brought pride to his country, Jamaica. 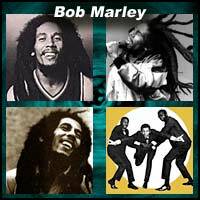 Bob Marley was born on February 6, 1945 in St. Ann, Jamaica as Robert Nesta Marley. He became reggae's greatest artist in the 60's when he was about 18 years old. Bob was in a group with Peter Tosh and Bunny Wailer called The Wailers. Although he had never had a song higher than 51 on America's music charts, he had quite a few number 1's in Jamaica. Bob's most popular song was probably "I Shot the Sheriff" which was originally released on his greatest album "Burnin'". Rock and blues artist Eric Clapton made a remake of this song, which made it to number 1 on the charts. Bob and the Wailers brought a different taste to reggae. It was more relaxing than other types of reggae. Bob has been remembered for years, and almost all reggae artists know that he was the greatest who lived. He died of cancer on May 11, 1981 in Miami, Flordia.